It was a sobering revelation when the Portland Housing Report showed last year that women have a particularly challenging time finding safe and affordable housing. 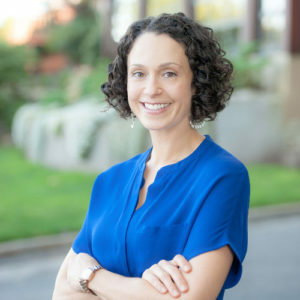 Single women with children have extra challenges – currently, there are no neighborhoods in Portland that are affordable to the average single mother. 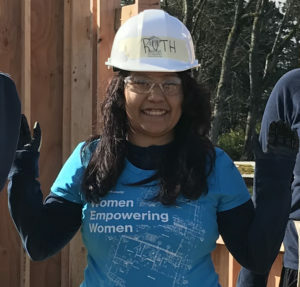 To bring light to this gender inequity, and in celebration of International Women’s Day this month, 25 Women Build volunteers and Habitat homebuyers united for our first Women Build day of the year at our 15-home Cully Place community in NE Portland. It was a bright and sunny, energetic and fun-filled day for sisters, aunts, friends, moms, and daughters teaching and learning new skills, making new friends, and deepening relationships. Newcomers worked alongside veteran volunteers and Habitat homebuyers to frame and raise walls, and secure siding on four homes. Habitat homebuyer Minh was among the women to volunteer that day. A single mother, Minh partnered with Habitat to build and purchase an affordable home for her and family. She’s put in many hours of sweat equity to build not only her home, but also her neighbors’ from the ground up. Women Build rallied for Minh from the start. Not only have they built along with her, they are sponsoring her home, having raised over $75,000 to support its construction. Thanks to KGW8 News, we can see more of Minh’s powerful story here. A Women Build day is a one-of-a-kind experience. With women-led crews and a welcoming environment (not to mention a tasty lunch and great coffee), women have a unique space to learn, build and lead. Volunteers discover a valuable way to give a hand up to help others and gain construction experience along the way. For more information on Women Build, click here. If you’re interested in volunteering at an upcoming quarterly Women Build event, please contact Cassie Punnett, Volunteer and Business Engagement Coordinator, at cassie@habitatportlandmetro.org. Want to support Women Build through your philanthropy? Consider learning more about the CREW – a group forming to Connect Resources to Empower Women. For more information about the CREW, please contact Lauren Johnson, Senior Donor Engagement Officer, at lauren@habitatportlandmetro.org. What do you think is important for people to know about Women Build? Everyone is welcome. No skills, some skills, or advanced skills, doesn’t matter. If you want to learn, we will teach you! The work that we do is very rewarding and it truly does make a difference. How have you learned, built, and led throughout this time? Even though I have only been involved with Women Build for a short time, it has already pushed me to learn outside of my comfort zone. During my first committee meeting for Women Build I decided to volunteer to lead the debrief for the International Women’s Day build. I would not normally attempt to do any sort of public speaking, but I felt safe and supported to do so. Afterward I received great feedback and was even asked if I had previously done public speaking (which I had not extensively). I hope to use my new- found confidence to keep stepping up as a leader in Women Build. How did you get involved in Women Build? My first experience with Women Build was in 2002 in the Twin Cities (St. Paul/Minneapolis). I had gone with some girlfriends and their moms, and was hooked from there! I was so excited to find out that our affiliate was starting Women Build here in 2004, so I jumped right in at the first meeting, and helped get the program launched. I volunteered with the organizing/fundraising committees behind the scenes, as well as onsite for several years starting in 2004/2005 with our first home on NE Sumner St. I stepped back a few years ago as I have limited time with career and kids, but still try to go out onsite once a year. What are your hopes for the future of WB? I would love for Women Build to continue on for years to come, and help build confidence and skills among more women/girls in our community. This housing crisis isn’t going to solve itself. Which aspects of Women Build align with your values? Women Build exists to help womxn and their families. When families have a stable home, anything is possible: kids achieve more in the classroom, parents aren’t always worrying about where their family is going to live next, relationships prosper. Affordable housing should be a human right. No person should go without other basic necessities to keep a roof over their head. I grew up in a single parent household and watched my mother sacrifice for my siblings and me over and over again. Women and children are most likely to be affected by poor living conditions and I am proud to be a part of an organization that is working to eradicate poverty housing. Can you tell me about a volunteer day that sticks out to you? Perhaps your favorite day? The Women Build that we completed for International Women’s Day was particularly powerful for me on a personal level. My sister is my best friend and we are extremely different; she is an introvert and I fall somewhere a million miles away from that. She is a strong woman and I worry sometimes that she doesn’t always see that in herself. Last weekend, she came out to volunteer with us and I was blown away. I always knew she would like construction, but she was totally in her element. By the end of the day, we had built an entire wall and she’d mastered framing, blocking, and using the chop saw. I’m so proud of her.